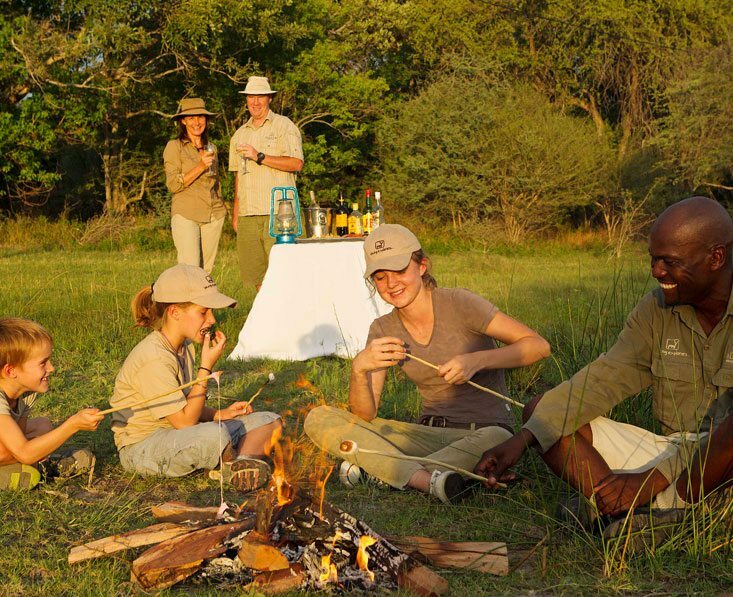 Camp Okuti is ideally placed for wildlife viewing in Moremi Game Reserve. Camp Okuti is ideally placed for wildlife viewing in Moremi Game Reserve. It’s situated on the banks of the Maunachira River, with distinctive guest rooms designed along traditional lines with high, curved roofs providing spacious, cool interiors with reed-lined walls, polished wooden floors and beds draped with mosquito nets. The veranda looks out over the water and is a lovely place to sit in peace and quiet. The en-suite bathroom has a hand basin and shower, with a separate toilet and an additional outdoor shower. Basic toiletries are supplied. Two of the chalets are larger with 2 bedrooms each, perfect for families, and there’s a honeymoon room. From each room a walkway leads to the main areas of the camp which include an open-sided dining room which looks out over a broad deck and campfire to the floodplains beyond, and a spacious lounge with a corner sofa and armchairs also with panoramic views, ideal for relaxing and sharing time with fellow guests. You can also browse through the selection of books and enjoy a board game. Outside there’s an attractive pool with a sundeck and loungers plus covered seating areas out of the heat. Moremi is rich in wildlife year round and game drives here will always delight and impress with the sheer variety and numbers of wildlife. The maze of waterways and lagoons is best explored by boat and at Camp Okuti you’ll be offered motorboat rides into the heart of the water system including on Xakanaxa Lagoon , a great way to observe the area’s many bird species such as egrets, storks and herons. This is a very quirky looking camp, especially from the outside but having been inside I found it was lovely. a refreshing change actually, as it’s a very different style of camp. This makes a lovely combination of big game drives and relaxing boating safaris, with friendly staff too! Children aged 7 years and over are welcome. Younger children may be accepted in low season, on request. There are two family rooms. The rooms are unique in design, based on local mosasas, houses of reeds. 8 guest houses including a honeymoon unit and 2 family units. En-suite bathrooms with full running water, flush toilet, indoor and outdoor showers. Family units have 2 bedrooms and a shared bathroom. Private viewing decks.